BRUSSELS, May 13 (Xinhua) -- After travelling 16 days and covering a distance of 11,000 km, the first China-Belgium freight train from China's Tangshan port has arrived in the Belgian port of Antwerp. 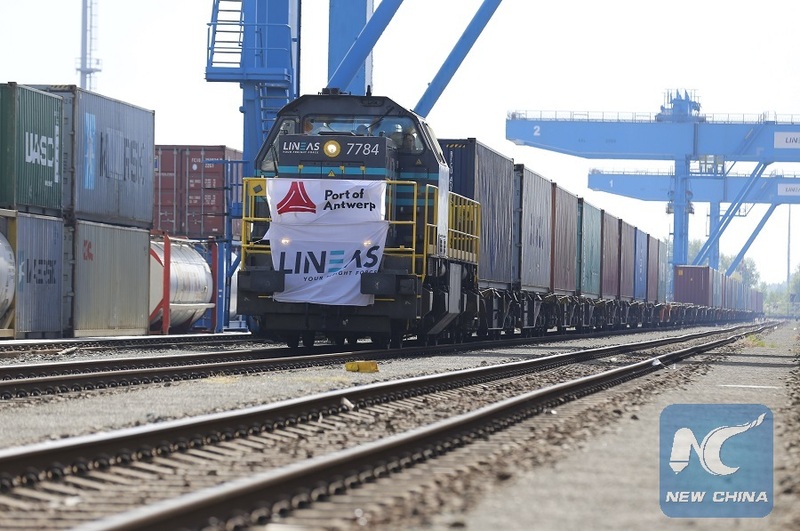 The train with 41 containers which left Tangshan on April 26, was officially welcomed on Saturday in Antwerp. The direct railway link between China and Belgium is part of the China-proposed Belt and Road Initiative. By opening up a new and quick route into China, the initiative offers plenty of new opportunities for the development of the Sino-Belgian trade relations. Luc Arnouts, Director International Networks, Antwerp Port Authority, said at the welcoming ceremony that "This direct train link puts our port on the BRI (the Belt and Road Initiative)map and will further strengthen our ties with China. We have long been working on this project, which represents an important milestone in our trade relations with China." In his speech, Guo Jianjun, economic counsellor of the Chinese Embassy in Belgium, pointed out that given the ongoing escalation of trade friction threats in major global economies, it is even more necessary for all parties to strengthen cooperation. "As Europe's second largest port, Antwerp has a very important position in Sino-Belgian trade," said Guo. "The arrival of the first China-Europe freight train sent by Tangshan to Antwerp today is historic and will have a profound and positive impact on China-Belgium cooperation", Guo concluded. The train has travelled through Kazakhstan,Russia, Belarus, Poland and Germany to reach its final destination, Antwerp. It is the first ever direct train service from China to Antwerp.